Today I thought I would share a quick and easy resist technique, great for cards or scrapbooking. 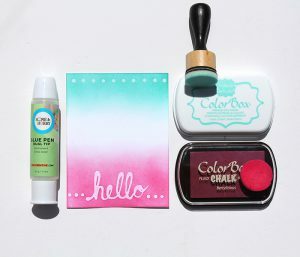 The good news is, you might even have everything you need for this tutorial is in your craft stash already! I started with a piece of white cardstock cut to 4 x 5.25 inch. To be honest I had a few of these cut and tried a few different designs. To start, you will want to put a little pressure on the Dual Tip Glue Pen tube to get out any bubbles. Keeping that pressure, you can now start writing or drawing. If you do get any bubbles, you can try popping them with a pin. Now let dry. I let this happen naturally, instead of using a heat gun. You don’t want to move your image. The image below shows my design with colour. 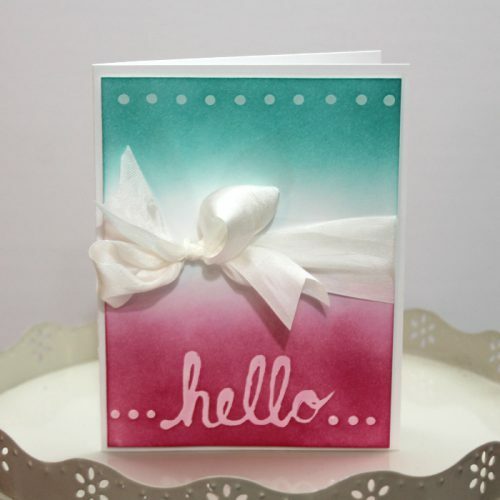 I added dots of Dual Tip Glue Pen at the top and bottom of the card, as well as the sentiment. Once your image is dry, then you can start the blending process. For this card I wanted the colour to emulate the popsicle summer treat we have all tried at least once. With my trusty blending tool I started at the top with the teal, and the bottom with the pink. Starting at the edges a little darker and blending inward getting lighter. 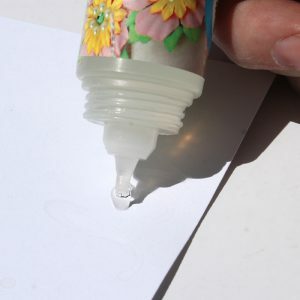 The dried Dual Tip Glue Pen adhesive resists the ink beautifully. You can use a tissue and wipe off any access ink residue left behind. Once I finished blending I then added my large silk ribbon bow. I added a little Extreme Double Sided Tape 1/8″ to the back of the cardstock to keep the ribbon in place. I then added 3D Foam Squares White Small to the back and adhered it to my plain cardstock card base. Then I tied my bow in front. Voila! 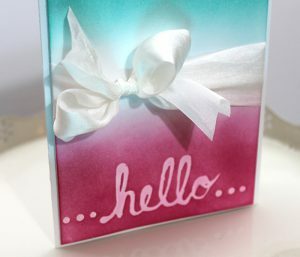 A sweet and simple card that is sure to brighten spirits. This entry was posted in 3D Foam Squares, Adhesives, Cards, Crafts & Tutorials, Embellishments, Extreme Double-Sided Tapes, HomeHobby by 3L, Other Adhesives, Permanent Adhesive, Scrapbook Page, Scrapbooking, Tutorial and tagged 3D Foam Squares Mix White, 3D Foam Squares Small White, Card, Card Making, Clearsnap, Dual Tip Glue Pen, Extreme Double-Sided Tape 1/8", Resist, Scrapbooking, Tracy McLennon. Bookmark the permalink. One Response to "Easy Resist Technique with the Dual Tip Glue Pen"